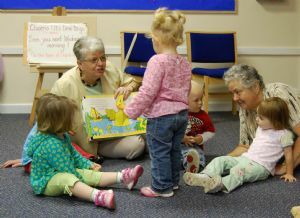 Our Tots and Tunes group is for babies and pre-nursery children. We meet every Wednesday from 10 to 11am during term time for an hour of fun with rhymes, action songs, stories and percussion. All are welcome and light refreshments are provided. The group meets on the church premises. For further information ring Marjorie Gray on 029 2088 3722. Due to the success of this group Helpers are urgently required. If you can help in any way please sign the appropriate sheet, or see Marjorie or Lynne as soon as possible. 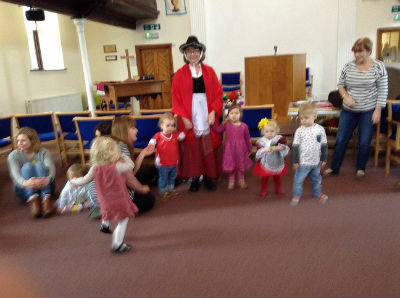 On St David's day some of the tots dressed up especially for the occasion as did Helen one of the leaders. The group also recently celebrated their 10th anniversary of helping youngsters to socialise with an entertaining mixture of songs and stories. Congratulations and thanks to Marjorie, Lynne and the rest of the team.